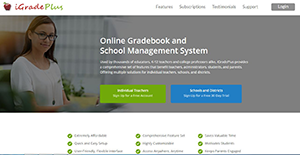 iGradePlus is a cloud-based gradebook and school management software designed for schools, individual instructors, districts including K-12, trade schools, and colleges. The platform has a highly customizable array of features which include; grade management, student and class management, custom report generation and distribution, district management, attendance and behavior monitoring, and student/parent communication features. iGradePlus is reliable and affordable software that can be accessed from any device and is compatible with multiple operating systems including Windows, Linux, and Mac OS. In addition, the system supports various browsers including; Firefox, Safari, Opera, Chrome web, and Internet Explorer. If you are in the market for an intuitive, easy to use, and efficient gradebook system, look no further. iGradePlus has a wide spectrum of features that make it a reliable solution for administrators, teachers, parents, and students. The platform exhibits its flexibility and affordability thanks to the various subscription options which offer a commendable set of features. The subscription plans include; Free plan for individuals with a limited budget, a premium subscription which is a full-featured plan for individual teachers, enterprise subscription a full-featured plan designed for schools and districts, and the branded subscription for schools which want to integrate the school management system with the school website. The student and class management functionality provides a robust set of features which help administrators and teachers to manage unlimited classes and students effectively. The features allow the maintenance of extensive students’ and parents’ profile data, document storage, transcripts, assignments, assessments, student behavior, lesson plans, class schedules, and attendance. Besides, it helps the teachers/administrator to add vital notes and custom fields to enhance information about their students. Additionally, iGradePlus has reliable grade management features which can be customized to suit a variety of usage. Besides, the behavior and attendance tracking features provide multiple ways of recording students’ behavior incidents. The feature gives you the freedom to add detailed notes regarding each incident. iGradePlus utilizes the SSL to encrypt data transfers. In addition, the platform encrypts sensitive data before storing it in the database. Organizations have diverse needs and requirements and no software platform can be perfect in such a situation. It is pointless to try to find a perfect out-of-the-box software app that fulfills all your business wants. The smart thing to do would be to adapt the solution for your special requirements, employee skill levels, finances, and other aspects. For these reasons, do not hasten and subscribe to well-publicized popular solutions. Though these may be widely used, they may not be the ideal fit for your unique needs. Do your homework, look into each short-listed system in detail, read a few iGradePlus reviews, call the maker for clarifications, and finally select the app that provides what you require. How Much Does iGradePlus Cost? We realize that when you make a decision to buy Learning Management System - LMS it’s important not only to see how experts evaluate it in their reviews, but also to find out if the real people and companies that buy it are actually satisfied with the product. That’s why we’ve created our behavior-based Customer Satisfaction Algorithm™ that gathers customer reviews, comments and iGradePlus reviews across a wide range of social media sites. The data is then presented in an easy to digest form showing how many people had positive and negative experience with iGradePlus. With that information at hand you should be equipped to make an informed buying decision that you won’t regret. What are iGradePlus pricing details? What integrations are available for iGradePlus? If you need more information about iGradePlus or you simply have a question let us know what you need and we’ll forward your request directly to the vendor.